I enjoy reading and writing books with a contemporary, realistic feel. That doesn’t mean I can’t go outside my comfort zone every few months and delve into other genres. This time science fiction was my chosen destination and SMASHER the perfect choice. It provided excitement along with time travel, kind of a sub-genre that gets a different focus in this one. The story is another boy saves the world adventure but with a twist. Twelve-year-old Charlie is from the 1500s and he travels to 2042. Awaiting him there is the evil Gramercy Foxx who plans to take control of every living mind. Many of the 70 chapters are short in length and the third person narrative bounces back and forth from Charlie to his nemesis. I’d have preferred a first person focus staying with Charlie the entire time, but that’s just me wanting to understand more about how Charlie’s mind works. What we are told did not go deep enough. The only other concern I had was Charlie took to being transferred 500 years in the future all too easily. His acceptance of the new world around him seemed like a stretch. I’d be awestruck by computers, elevators, helicopters, and skyscrapers. Charlie took it all in stride like he’d just gotten off a plane and was visiting this new place. Anyway, tech loving kids should gravitate to this one. It’s an exciting ride from the startling opening to the fantastic finish. SMASHER. What a great title for a book with a cover to match. Geneva is Charlie’s robotic helper from the future. The story of her past was just as intriguing as Charlies. I’d welcome a book with her as the main protagonist. I always enjoy a story where you know what is going to happen next, and then something totally different takes you by surprise. There were quite a few moments like this and all were page turning. The spider robots. I’m not a big fan of spiders but these were electric. The author works in the tech industry and his knowledge of it showed. Don’t expect to understand it anymore but just accept that it’s happening. Technology drives the story but doesn’t overwhelm it to the point you wouldn’t understand the plot. He wanted to scream, but he couldn’t because of the frog in his mouth. 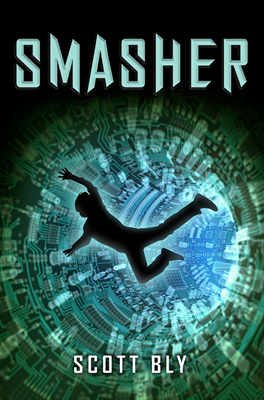 This entry was posted in Reviews and tagged Middle grade, Middle Grade Book Reviews, Scott Bly, Smasher. Bookmark the permalink. Thanks for the Pin, and especially thanks for dropping by every week. I’ve been meaning to stop by and thank you for the incredible collection of MG books I won here! When I received them, I immediately took an photo to post on FB, but realized were not FB friends. 😦 Maybe you don’t have a FB, which is okay. Just wanted you to know I received them and that my almost 11-year-old son is in heaven! It’s great to know the books found a good home. Hope to do another contest before another year goes by. Yes, I’m a FB drop-out from a few years ago. Probably have to restart once I get my own platform going. Thanks for stopping by. Alright, this sounds like a must get, must read and must share, to me! Can already think of some readers who I know will be all over this. Thanks! Sounds like a good time travel read for middle graders. Interesting premise and a lot of action. Ohmygoodness, I love that fav line! This one sounds right up my alley, and exactly the kind of book I’ve been looking for as I love scifi but don’t find that much of it in MG. Thanks for the heads up, and happy MMGM! That does sound like an interesting twist–a boy from the past coming to the future instead of the opposite. And I love that line you shared! Plus, I have a soft spot for time travel anyway. I’ll have to check this one out! Sounds interesting! I love your style of posting with “Five Things to Like…” because it really gives a good sense of what makes a book unique. Sounds really different, Greg. What a great line you quoted. I would have expected Charlie to be totally stunned by all the “new” inventions since his time. Heck, even cars, electricity and telephones, not just smart phones! I agree, I love your Five Things to Like sections–helps so much. This sounds fantastic, and that line is a winner! Not too many MG time travel or sci-fi books. This sounds good even with your concerns. Thanks for sharing it with us. you had me at spider robots. But I agree – traveling 500 years into future should give one pause… even if one is an adventuresome soul. At the very least, getting to know the technology. I remember some Star Trek movie where they arrive on earth in the past (but our present) and Scotty says “Computer On” – but we’re still at the stage of toggle switches, not Voice-activated. I love time travel stories, and this one seems very interesting, someone from the past who travels to the future. Man, my to-read list is already too long! Too many books, too little time! Yes, my TBR list is longer than ever. Looking forward to having you join my blog this Thursday where your innermost thoughts will be revealed. Okay, maybe just your answers to six of my questions. See you then! I love your favorite line. I don’t read science fiction, but if I did, I might like this one. Thanks for the review. Sounds interesting. I love your favorite line! Did he really have a frog in his mouth? With boys you never know :o) I love time travel, too, but I’d love to go into the past. Yes, the frog was in his mouth. Not his doing though. It certainly got me wanting to read more!